Sometimes, our laws just don't make a lot of sense. 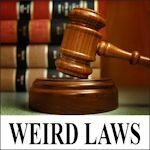 The following is an assortment of weird, strange, and head-scratching laws and statutes about bicycles within the state of Kansas. "Bicycle" means every device propelled by human power upon which any person may ride, having two (2) tandem wheels, either of which is more than fourteen (14) inches in diameter. Unicycles, tricycles and quad-cycles are not "bicycles" under Kansas law, apparently. No person shall sell a pedal for use on a bicycle, unless such pedal is equipped with a reflector of a type approved by the secretary of transportation which is visible from the front and rear of the bicycle to which it is attached during darkness from a distance of two hundred (200) feet, and no person shall sell a new bicycle, unless it is equipped with pedals meeting the requirements of this subsection. It's illegal to sell a bicycle pedal without reflectors (or a new bicycle without pedal reflectors), but there's no requirement to actually to ride with the pedal reflectors. Every person riding a bicycle within the corporate limits of the city shall, at all times, ride the same on the right-hand side of the street, and shall not ride the same from one side of the street to the other except at the intersection of streets, and then only around and to the right of the marker there placed to designate such place of turning, or, where there is no marker, around and to the right of the center of such intersection, and every person riding such bicycle from one street into another shall ride the same around and to the right of such marker or, where there is no marker, around and to the right of the center of the intersection. It is unlawful for more than 1 person at a time to ride on a bicycle. Tandem bicycles, bakfiets, and bike-mounted child carriers are against the law in Chanute, apparently. No bicyclist or motorcyclist shall curve to and fro on his or her vehicle or ride without his or her hands on the handlebars. Neither state law nor any other Kansas cities (that I'm aware of) have these particular prohibitions. Side reflectors, attached to both sides of the bicycle, which shall be of sufficient size and reflectivity to be visible in clear weather from both sides at all distances from one hundred feet to six hundred feet when directly in front of the lawful lower beams of the head lamps on a motor vehicle. State law does not require side reflectors, nor do any other Kansas cities (that I'm aware of). No person shall ride a bicycle or motorized bicycle upon the grass or sidewalk, walking trail or jogging trail in the Finnup Park, A. Harold Long Park, Stevens Park, or Finney County Courthouse Square, nor upon or across the lawn of any private property in the city, nor on the grass or sidewalk around the swimming pool, nor in Deane Wiley Park. Ottawa, KS – 8-109: Restrictions on riding of motorcycles, mopeds and bicycles. It shall be unlawful for any person to ride a bicycle, motorcycle or moped upon paths for pedestrians within City parks unless such person, upon meeting any pedestrian, shall stop such bicycle, motorcycle or moped and dismount until such pedestrian has passed and such person shall not again mount such bicycle, motorcycle or moped until entirely past such pedestrian. This sign is on the Chieftain Trail and reads "Trail Is Not For Nighttime Use". Apparently this is an advisory sign, and not a regulatory sign, and was erected because the "lighting on the trail did not meet KDOT requirements" (see story). Topeka, KS – 142-611d: Riding on sidewalks regulated. No person riding a bicycle on a sidewalk shall exceed a speed of five miles per hour. 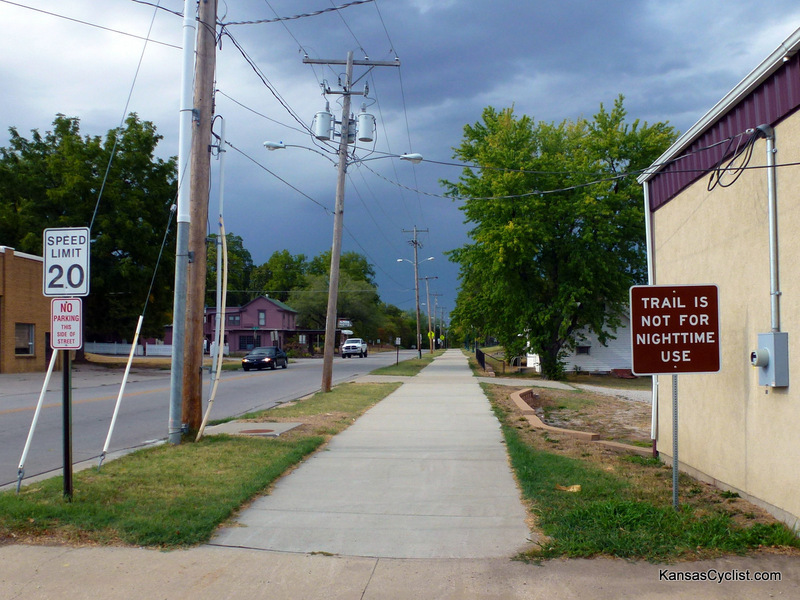 If you ride on a sidewalk in Topeka, you must go really, really slow.